Bad news and Good news…. Today is last day to get any items from the Stampin Up 2011-2012 IBC but tomorrow the 2012-2013 IBC goes live. Today’s card is another masculine card using the Nature’s Nest #113826 stampset that will no longer be available after today. 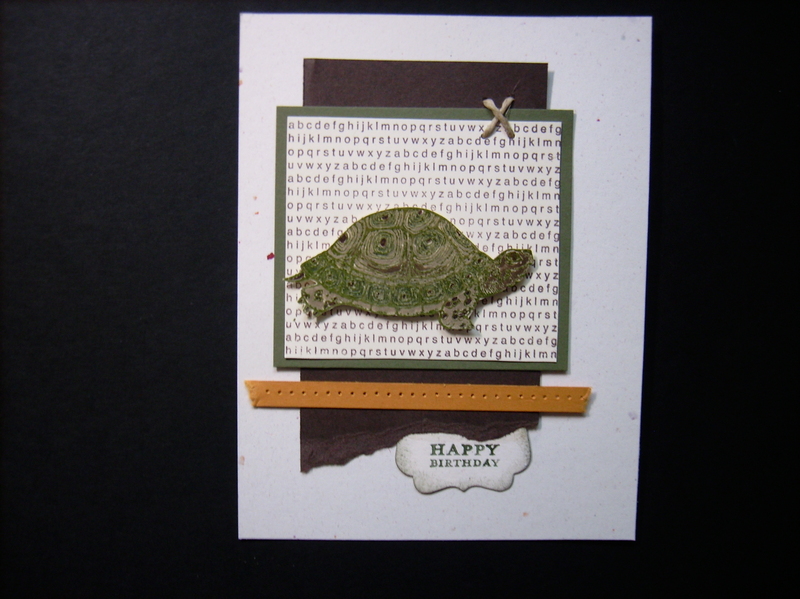 This card is a CASE from page 122 of the soon to be gone 2011-2012 Stampin Up IBC. Also gone on this card is the A to Z background stamp #115711, the natural confetti #102316 card base and the hemp twine #100982. Time is running out to get anything from the current 2011-2012 Stampin Up IBC. TODAY at midnight all going going gone items will be gone forever! Time is running out to get anything from the current Stampin Up IBC, hurry up and get your 1/4″ grossgrain ribbon and all other going going gone items because they will be gone tomorow and will not be carried over to the new catalog. Today’s post features a hybrid card using the MDS card front that I designed and then uploaded to staples to print. Turned out great. 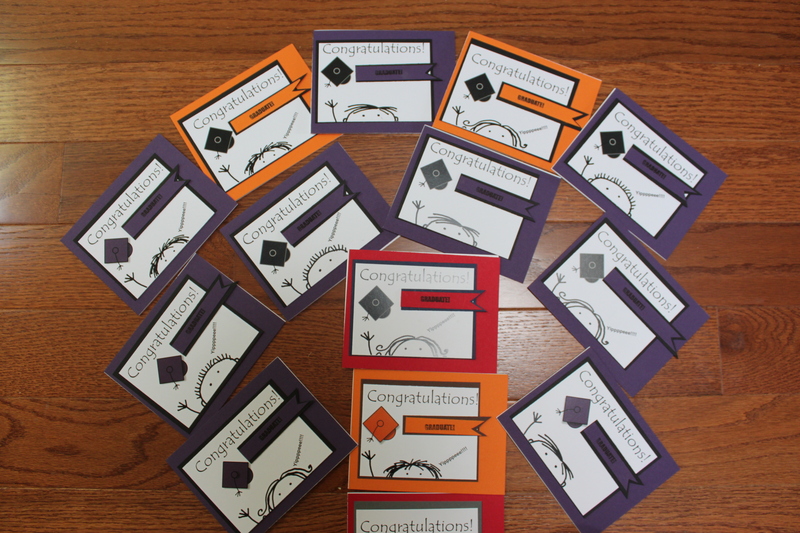 Then I customized each card to match the school colors. Love how it turned out but cannot believe how many graduations we have this year. Cha Ching. If you are interested in custom graduation cards contact me. Cammie made these cards for her shop and for a charity event in Tulsa. The design is simple but the output made a huge impact for breast cancer awareness month. The cards have the same layout using the vintage wallpaper texture plate #120175 and the retiring simple alphabet #115960. The “O” is retiring ribbon of hope #115552 stamp or a piece of mambo ribbon made into the ribbon of hope. Today’s post is a very popular card at Cammie’s card shop in Tulsa. This card features items that will be carried over into the new Stampin Up catalog and ones that will be retiring in a few short days. The card base is Island indigo (carried over), DSP is First Edition #121878 (carried over). The scallop circle punch #119854 coordinates with the stamped image from the soon to be retired Hostess stamp set, precious butterflies, #122517. 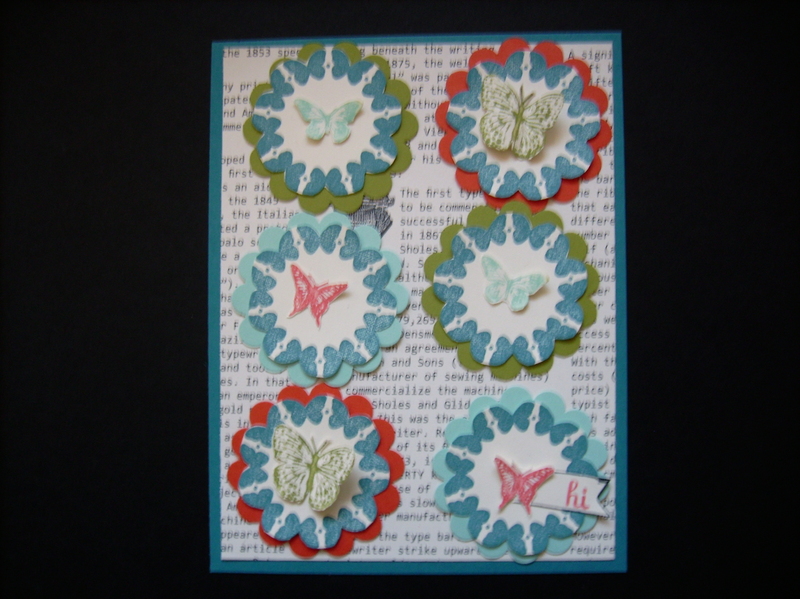 The butterflies are stamped from the Kindness Matters #122902 set and then cut out ans randomly popped in the center of each circle. Only 4 more days to place your order from the going going gone 2011-2012 IBC and could earn the hostess set and hostess dollars. 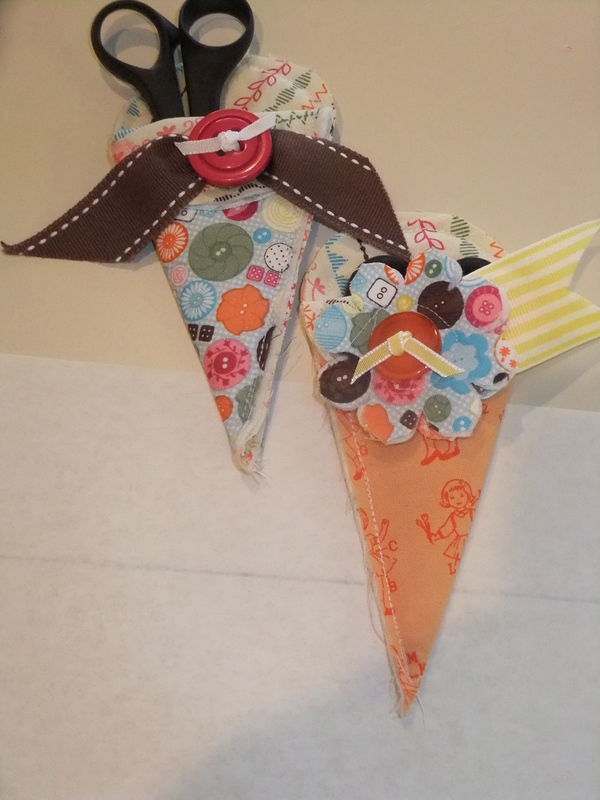 Today I am featuring the very cute scissor holders that Cammie made and is selling for $6 dollars. Sewing is Cammie’s true first love and she made these out of lots of different Stampin Up fabrics. If you are interested in a very cute scissor holder for yourself or for a gift email Cammie at cammiet@att.net and she will make a pair for you. Happy Birthday Baby sister, Blair or should I say Sponge Bob Blair Pants? Today we celebrate Blair’s birthday and Cammie and I conspired to each make her a punch art card (we made others for her too). Cammie chose Hello Kitty because as a young girl Blair loved Kitty and Cammie spoiled Blair by using her tip money to buy Blair all the Hello Kitty stuff. I chose Sponge Bob frankly because I saw it on a fellow blog and knew that I would recreate it since Blair’s corpsman call her Sponge Bob Blair pants. It is a term of endearment because some say she has a square bottom. Cammie and I made Blair other cards too and they will be posted another day.